Florida Lexus dealer Jim Dunn winced recently when he had to write a check for $200,000 -- for light bulbs. But they are light bulbs with a mission. Dunn is installing energy-efficient LED bulbs throughout his 3.5-acre operation, along with myriad other green conversions. Dunn, general manager of the world's largest Lexus store, JM Lexus of Margate, Fla., and the corporate owner, JM Family Enterprises, believe that the world of environmental consciousness and the luxury auto market are converging. Dunn wants his Lexus dealership to be at the crossroads when they meet. 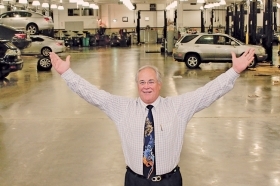 Dunn has been coaxing the three-story, 150,000-square-foot dealership back to health after the crash of 2008. In 2007, JM sold 7,720 new vehicles. There seemed to be no end in sight to the demand for luxury and opulence in South Florida. But in 2008, volumes plummeted to about 4,000 vehicles. In response, Dunn and his management team took the Lexus megastore more heavily into pre-owned vehicles. Those sales alone will probably exceed 2,500 in 2010, he said. "We've held off on some of the other things we've wanted to do here, but not this environmental initiative. It's too important," he said. In the body shop, Dunn spent $90,000 to switch from oxygen-based paint spray guns to a nitrogen spray system. The store also has taken many other environmentally friendly steps, including replacing all lighting fixtures throughout the property. "We're learning to do more with less," Dunn said. "We will definitely get a return from all this."